Does the Salvadoran diaspora care about elections? 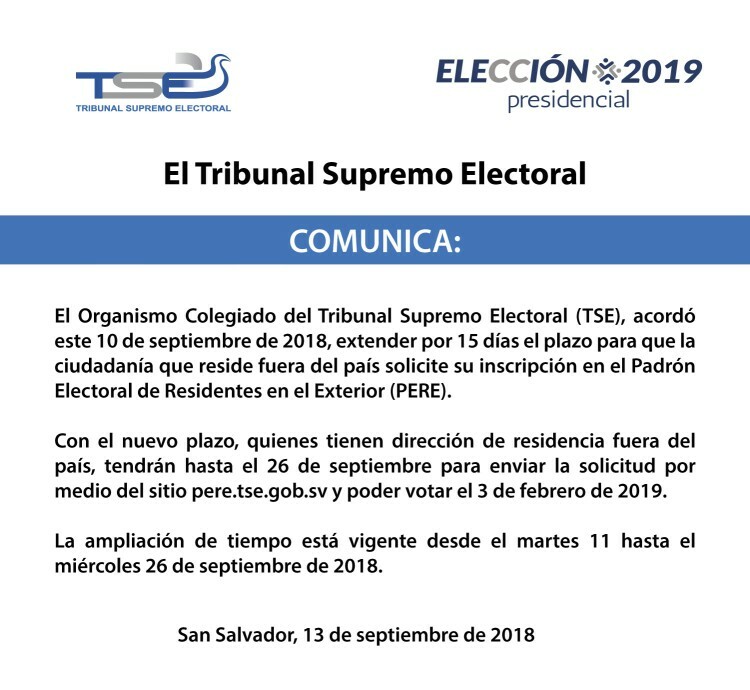 Citizens of El Salvador who live outside of the country are eligible to vote in the upcoming 2019 presidential elections. Yet as of the September 6 deadline, only about 1% of the eligible voters (3541) outside of the country had taken the steps to sign up to vote in 2019. The essential requirement for voting is that a Salvadoran citizen must have an unexpired national identity card (DUI) with their current address outside of El Salvador. For each election, they must register online to vote in order to have a ballot sent to them. It is not clear why so few have registered to get a ballot. Perhaps they simply don't see how the election will impact their lives, especially those living in the anti-immigrant atmosphere generated by Donald Trump in the US. There have also been some reports of difficulties in using the online site of the Salvadoran election tribunal where voters register. The 3541 Salvadorans who have registered to vote in 2019, is actually up from the number who voted in the 2014 presidential election. In the second round of the last presidential election in 2014, 2334 votes were cast by Salvadorans outside of the country. Their vote split 1480 for the FMLN and Salvador Sanchez Ceren and 854 votes for ARENA and Norman Quijano. The 2014 presidential election was decided by only six thousand votes. The votes of the Salvadoran diaspora could make a difference in 2019, if one political party or another could figure out a way to motivate its supporters outside of the country to register and vote.